CardExchange® Visitor Management software is a flexible package that supports the control and tracking of visitors within your organisation. From unlimited recordkeeping and bespoke ID badge design to multiple event management and self-registration via barcode and kiosk. Identifying, authorising and tracking the people entering and exiting your building is no longer a headache with this GDPR compliant CardExchange® Visitor Management Software. CardExchange® enables smooth registration and professional badge design for your front-desk function and captures vital data on visitor types for evacuation reports and watch lists. Extremely easy to navigate, with a Microsoft look and feel, this visitor tracking software enables you to minimise security risks, reduce backlog, categorise visitors and even manage events. Want to eliminate the chaos of event registration? The event management feature of CardExchange® Visitor Management Software offers a host of tools to get your event underway smoothly and efficiently. Assign a host, a room, check-in times and even set up a touch-screen kiosk for barcode self-registration to avoid lobby congestion or for unattended venues. First impressions matter – a streamlined registration process provides the best visitor experience. With CardExchange® Visitor Management Software, you can pre-register visitors, offering them a barcode that allows them to self-sign-in at your reception desk or kiosk. A superior, branded visitor badge is just a few clicks away with CardExchange®. Its intuitive, flexible design tools allow you to create badges with the exact features your organisation needs, either from scratch or from a helpful template. Create the perfect format with the WYSIWYG feature. With security and employee safety in mind, produce a watch list of employees and visitors to monitor internally or to link with external criminal databases. Need to populate your data records with official ID documents, business card, photo and signature of your visitors? It’s easy with the CardExchange® multiple image and data storage feature. Another safety element shows you exactly who is in your building and can create an evacuation report to ensure the safe exit of visitors in an emergency. Understanding your visitor types (contractor, guest or delivery person) and controlling their access to certain areas of your building is straightforward. You can also issue visitors with policy documents to sign on arrival. 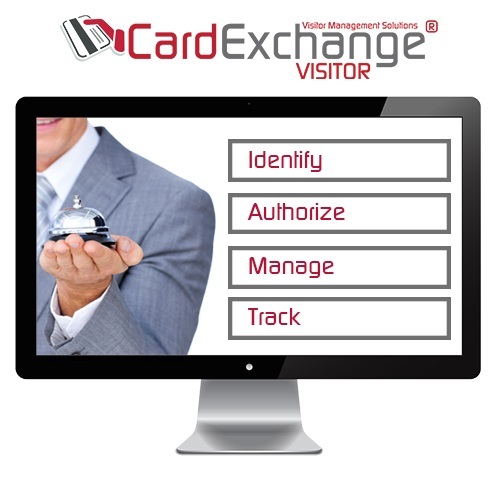 CardExchange® Visitor Management Software grows with your business with easy upgrades to suit your needs. Create bespoke visitor badges from easy-to-manage unlimited visitor records and produce useful reports. Customise your visitor record fields and store multiple images, ID documents and vehicle registrations with this popular mid-range software package. The top-of-the-range Business Edition handles event management with ease. With advanced features, it allows you to identify, authorise and manage visitors in a secure, straightforward way.